Jan Pieńkowski is an illustrator most famous for the ‘Meg and Mog’ series, but I particularly like his silhouette work, which is a very different style. He has illustrated a number of fairytales like this; the image shown is a story about Baba Yaga from a collection called “The Kingdom under the Sea” and I think that the swirling, marbled backgrounds give a sense of a magical, otherworldly setting. Although his silhouettes are detailed I don’t think his work ever looks particularly cluttered. In this picture there are a number of narrative elements – I find the chicken-legged house particularly intriguing, and you could probably come up with a story just by looking at this single image. 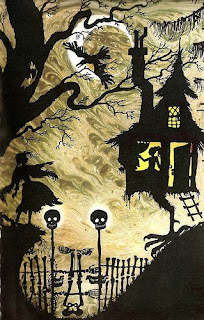 I owned this book as a child and really loved the sense of atmosphere in the illustrations, some of which were quite dark/creepy. I’d recommend his older work as I think in more recent books the silhouettes are more cartoon-like and less elegant, though it may be that they’re aimed at younger children.